Sri City, January 26, 2018:- The 69th Republic Day was celebrated with enthusiasm and zeal in Sri City. In a colourful ceremony held at the lawns of Business Centre Mrs. Vimala Kumari, Dy. 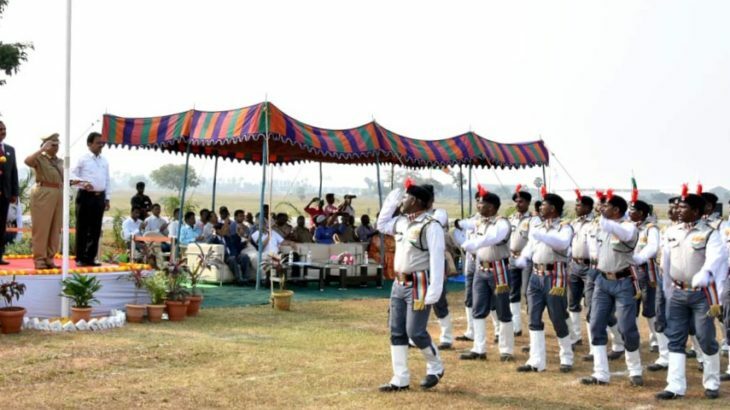 Superintendent of Police, Sri City unfurled the National Flag, and took salute in an impressive parade held by the contingents of Sri City security force. Addressing the gathering she eulogised the growth and development of Sri City, and assured that the law and order situation will be improved further. Mr. C. Vijaya Bhaskar, Specified officer – Customs, Mr. Satish kamat, President (Operations), Mr. Rameshkumar C, VP, and Mr. A. Sanyasi Rao, GM also spoke. Mr. Shaik Altaf, General Manager, Security & Vigilance extended warm welcome to the Chief Guest. As a part of the Republic day celebration, a ‘Make in India’ marathon was organised, under the joint aegis of Sri City Foundation, Indian Institute of Information Technology (IIIT) and Institute for Financial Management and Research (IFMR). Soaking the ‘business city’ in their bubbling energy and enthusiasm, over 800 persons, representing the students, employees of industries and general public, hit the roads of Sri City for taking part in the ‘run’. At the dawn, the Raavi Circle on the Central Expressway, in front of IFMR, where the 10K & 5K runs began, saw a riot of colour. Mrs. Vimala Kumari, Dy Superintendent of Police, Sri City flagged off the 10K & 5K runs. Prof. P.K. Biswas Director, IFMR and Prof Viswanath, IIIT have distributed prizes and trophies. Senior executives of Sri City units and several others with their presence added gloss to the event. It’s the third consecutive marathon held in Sri City. Mr. P. Ramachandra Reddy of IIIT coordinated the arrangements.